American males enter adulthood through a peculiar rite of passage – they spend most of their savings on a shiny piece of rock. They could invest the money in assets that will compound over time and someday provide a nest egg. Instead, they trade that money for a diamond ring, which isn’t much of an asset at all. As soon as you leave the jeweler with a diamond, it loses over 50% of its value. 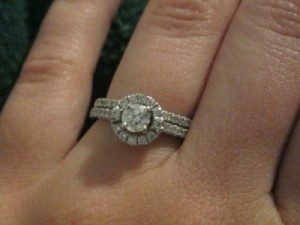 Americans exchange diamond rings as part of the engagement process, because in 1938 De Beersdecided that they would like us to. Prior to a stunningly successful marketing campaign 1938, Americans occasionally exchanged engagement rings, but wasn’t a pervasive occurrence. Countless American dudes will attest that the societal obligation to furnish a diamond engagement ring is both stressful and expensive. But here’s the thing – this obligation only exists because the company that stands to profit from it willed it into existence. But with that caveat in mind, the market for gold is fairly liquid and gold is fungible – you can trade one large piece of gold for ten smalls ones like you can a ten dollar bill for a ten one dollar bills. These characteristics make it a feasible potential investment. The next time you look at a diamond, consider this. Nearly every American marriage begins with a diamond because a bunch of rich white men in the 1940s convinced everyone that its size determines your self worth. They created this convention – that unless a man purchases (an intrinsically useless) diamond, his life is a failure – while sitting in a room, racking their brains on how to sell diamonds that no one wanted. With this insight, they began marketing diamonds as a symbol of status and love:Movie idols, the paragons of romance for the mass audience, would be given diamonds to use as their symbols of indestructible love. In addition, the agency suggested offering stories and society photographs to selected magazines and newspapers which would reinforce the link between diamonds and romance. Stories would stress the size of diamonds that celebrities presented to their loved ones, and photographs would conspicuously show the glittering stone on the hand of a well-known woman. The De Beers marketing machine continued to churn out the hits. They circulated marketing materials suggesting, apropos of nothing, that a man should spend one month’s salary on a diamond ring. It worked so well that De Beers arbitrarily decided to increase the suggestion to two months salary. That’s why you think that you need to spend two month’s salary on a ring – because the suppliers of the product said so. READ 2005: Procession and the Golden Age: How Much Did the Ancients Know?